Pine Knot Trail - 1E01 - New Trailhead! - October 2013 - Big Bear Mountain Biking Trail Guide Maps GPS - Hiking Trails too! Pine Knot Trail is the longest up/down singletrack on the South side of the lake. In 2013 the trailhead was moved to the back of the Mill Creek Rd. / Aspen Glen Picnic Area. 2/3mi of the old trail was closed and a new 1 mile of beautiful singletrack through black oak forest was created. This new singletrack is hike-able and ride-able in both directions. The Pine Knot Trail is now about 3.5 miles long. If you take it all the way to the end you will be at Grandview Point. Grandview point is a spectacular view where you can see the entire San Gorgonio mountain range. San Gorgonio is the highest point in S. California at 11,500ft. The Pine Knot Trail can be used to access Cabin 89 trail as a loop (see below) or it joins with the Skyline Trail about 3 miles up from Mill Creek Rd. While the trail can be challenging for those not used to the thin air at altitude, this is the easiest trail on the South side of the lake. You can now hike or mountain bike a short loop or longer loop in addition to the out and back pine knot trail. 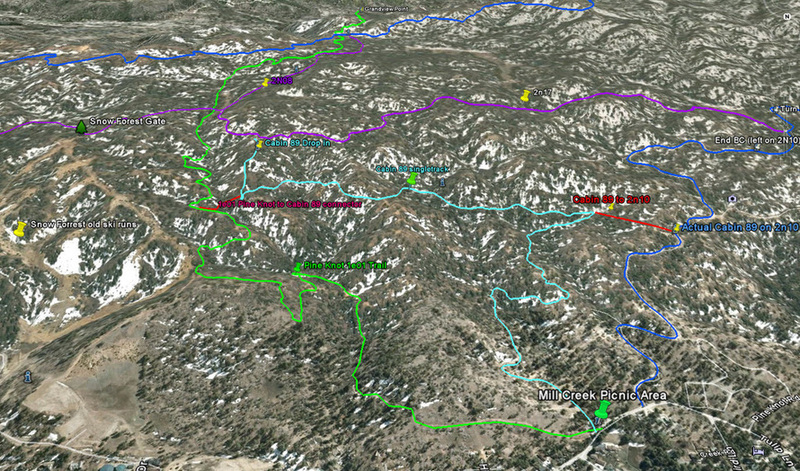 This is the route you would follow if doing and out and back on Pine Knot Trail from Mill Creek parking lot. Grandview point to Aspen Glen Picnic Area viedo bike descent. Fun flowing singletrack all the way! Pine Knot Trail Guide- Big Bear CA from hightrails on Vimeo.